#1. He was born February 17, 1948 in Van Wert, Ohio to parents, Ernest and Gertrude. He was raised in Rockford and lived there most of his life with the exception of a year on a Navajo Mission in New Mexico. He was the second of five children- with siblings Robert, Paul, Ann and Phil. The essence of his life would exude exactly the teachings of his parents. #2. As a child, our precocious recipient was self- taught and learned to play music by ear. When he wasn’t getting in trouble with his equally ornery brothers, he was building things, like radios. #3 The Class of 1966 Parkway High School graduate went on to attend Huntington College for three years while majoring in Education. There was one notable person who made a lasting impression on him during high school- industrial arts teacher, Ted Hakes. This influence was the vehicle directing his career choice to become a self-employed construction contractor during his entire working career. Many buildings in Rockford have been remodeled by him! Have you guessed who it is yet? #4. Wedding vows by the soul-mates were exchanged on September 7, 1974 at the Continental United Methodist Church. Two years later, the couple was baptized in Dan Henkle’s pond and then became members of the Rockford United Methodist Church. This is the same church where he has served as Trustee and Maintenance worker for several years; Parishioners can witness him making a joyful noise by playing instruments such as the guitar, trumpet, fiddle, banjo, and harmonica in the band on Sunday Mornings! #5. Together, he and his beloved wife, Marcia, have raised children Julie and Curtis- their pride and joy! The engaging father and grandfather enjoys attending music recitals and sporting events, and dotes on his beloved family by building them special handcrafted gifts made of wood. Grandchildren Alaina, Sloane, Madison, Paxton and Grayden are the proud beneficiaries of projects such as doll cradles, rocking chairs, a tool bench and a special handmade kite. Being a teacher at heart, our recipient involves family members in the making of such items. #6. His parents, aunts and uncles were important in his life, especially Uncle Nelson who ran the Navajo Mission in New Mexico. While there doing maintenance work, he lived with his brother Paul and learned many things about God, faith, and serving others. Many people who know him, know of his strong convictions and belief in the Bible, and his unwavering ability to speak out as a Christian believer. #7. Favorite pastimes have included repairing vintage radios and TVs, playing music, collecting license plates, bicycle riding and visiting friends, and fixing things around town. One of the oldest homes in Rockford is owned and remodeled by this truly gifted jack-of-all tradesman! #8. Active memberships include Shanes Crossing Historical Society, Rockford Lions Club, Parkway Booster Club, and The American Legion Post #508- where the stars and stripes hold a special place in his heart. He shows allegiance to his country and honors those that have fallen by marching in Memorial Day parades. The patriot flies a flag at his home and shows family support through the purchase of veteran bricks at Shanes Park. #9. Over the years, several updates and new installations have been made at the Rockford United Methodist Church; while attending services, congregants behold an impressive, prominent 7 foot cross which graces the sanctuary. #10. Countless hours of service, maintenance tasks and projects have been donated to our community. Our recipient has built benches at Shanes Park; repaired and painted the Log House in the park; donated and installed a stained glass window and chandeliers from the former Grace EUB Church in town hall; performed maintenance repairs at the American Legion; and, methodically painted the state-owned Rockford signs as you enter the corporation limits. Oftentimes, a friend or two can be seen working together on such projects, like Reed Shafer, Lowell Beougher and Mike Schumm. #11. It has been a blessing for our recipient to live in the small village of Rockford and he shows his devotion by donating many items from Rockford’s past to the museum. Rockford history aficionados can enjoy books, news articles, pictures, postcards and even a railroad station model! #12. Rockford, Ohio is a better place to live due to Steve’s exceptional attention to detail, genuine caring touch and ambitious drive to get things accomplished. God, family and service are the predominant factors in this man’s life. Community members can take a lesson from his quiet, humble demeanor whose lifelong contributions echo immeasurable lasting rewards to the senses at every turn throughout the village at Rockford! 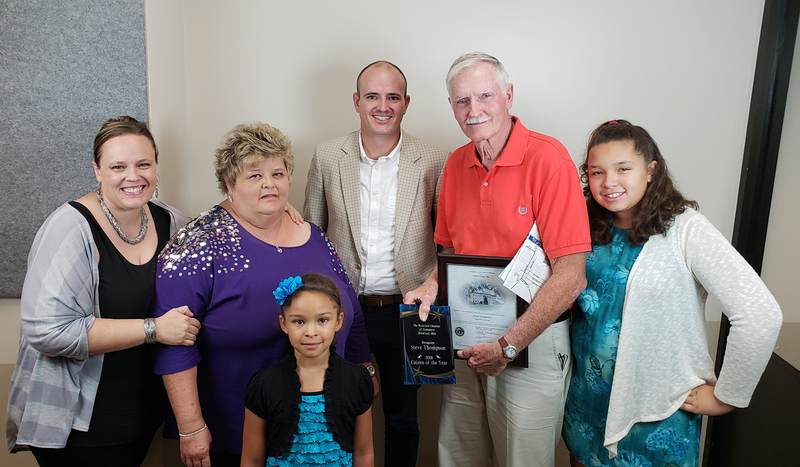 Congratulations Steven McBride Thompson on becoming 2018 Citizen of the Year.